Considering how long I have been a Christian, you would think I would be able to rattle off the 12 disciples names without giving it much thought. However, I struggle over their names because quite a few of them have two or three names! It would be like memorizing the first, middle and last name of 12 people. I hate to use the cop-out that I am bad with names….but I am! With unnamed spouses, that accounts for nearly 50 of the 120! Are you surprised that you know that many? God is a God of detail! John, witnessed this scene playing out at the foot of the cross. Can you imagine the surprise on his face when it dawned on him that this scene explained the song that was sung in the temple on occasion? Today, we have the gift of hind-sight so the fulfilling of Old Testament writings may not be as remarkable to us. But, for the gospel writers…it was miraculous!! I’m sure it helped strengthen their faith after Jesus left them to return God. I would imagine they began to pour over ancient writings to see what else Jesus fulfilled in his 33 years on this planet. And with each discovery, they would smile at each other and say, “I remember he did that, do you remember? !” It’s been said that they found over 300 prophecies that Jesus fulfilled through His life, death and resurrection! If you got a chance to read Day 26’s blog, you would have read how chapter 6 can be looked at as a “transferring of devoted God followers to be devoted Jesus followers”. That was a new way, for me, to see and understand certain verses. Now, with that same lens, I am reading chapter 17 in a similar way. This was a pivotal time in history! For thousands of years the “chosen people” worshipped one God. They were monotheistic in a world of polytheistic thinking. We get glimpses of average Jewish people (not referring to the ones formally trained in the Law) being devoted to God and looking forward to the promised Messiah. I just love the prayer of Jesus in 17:1-19 for these first believers. And I feel utterly honored that he also prayed for me!!!! (and you!) in 17:20-21. When one completely understands that the Father and Jesus are one, than there is understanding when one reads, “No one can come to me unless the Father who sent me draws him,..”(John 6:44). The transfer has occurred. One can not stay devoted to God alone any longer. God has made it that anyone who truly listens to Him and learns from Him will naturally come to Jesus (6:46). Jesus us repeating himself again! I better listen up! To me, that sounds too lofty to ever achieve in this life time! How will I ever be able to attain that? We have two tools that help us copy Jesus. 1.) We have his recorded example in the Gospels. The more you read His Word, the more you will know Him and how he would respond in situations. 2.) We have a “Counselor” who lives with us and in us! (14:17). He helps us remember and understand what we know and learn from Jesus! He tells us how to copy Jesus! Whew! Thanks Jesus, for not leaving us to guess how to love and obey. You showed us with your life and gave us part of you to live in our hearts. You gave us everything we need. I kind’a feel sorry for those first believers in the Christian faith. Talking about feeling alone in your faith! Especially those believers who were leaders in the Jewish community! We read in chapter 12, “Even after Jesus had done all these miraculous signs in the their presence, they still would not believe in him.” (vs.37) However, John gives us a little hope that not all those Jewish leaders were blind with “dead hearts”. Yes, it would be really hard to go counter culture to everything you know and confess one’s faith, but that is exactly what Christ has called them (and us) to do. Fortunately we get to know about two of these religious leaders who did eventually do a public confession of sorts. Nick and Jo!! I like hearing about how these two “confessed”, I am sure others of “the many” who believed confessed also, but I wonder about the others….. The verse that stood out to me today was when Jesus was talking to the crowd and said, “Stop judging by mere appearances, and make a right judgement.” (7:24) Do you know that he said basically the same thing nearly 1000 years earlier? Well, how do we make a right judgement? A simple answer would be, look at the heart of the matter, have a heart like God’s. Jesus hasn’t changed! He is still looking at our hearts to see if we are “after his own heart”. I believe you are after God’s heart since you are reading His word daily and trying to get to know him better. The Holy Spirit will guide you in to understand of what you read and help you see the heart, spirit and intent of God’s word (as we will soon read in John 14:26). With the Holy Spirit’s guidance, you will be able to “make a right judgement”! Well, which one is it? Only those God draws or all men who Jesus draws? Myers notes that Jesus is speaking to Jewish people only, when he is talking about those who come to follow Him “were given to Him by God”. (John 6:37,39, 44, 65). Now, in a sense, they are being “transferred" to Jesus. Wow!! What a whole new way of looking at the verses listed above!! It also helped me understand what is written later in John 12:32; When Jesus is crucified (lifted up), that loving act will draw ALL men, Jews and Gentiles (that’s me!!!!). I thought I would give you some interesting background I discovered regarding the snake on the stick. The story of Moses lifting the snake can be found in Numbers 21:9. If the Israelites, who were being bitten by venomous snakes, looked at the bronze snake, they would live and not die from the bites. Pretty cool foreshadowing on God’s part, don’t you think?! Even in the time of Moses, He is looking ahead to his Son, Jesus, fulfilling his plan. What you might not know is that the Israelites kept the bronze snake along with other holy items like the Ark of the Covenant filled with some manna in a gold jar and Aaron’s staff (Romans 9:4), etc.. They kept that bronze snake for almost 700 years!!!!! But, as you can imagine, the generations that followed after the generation that got healed by God, started thinking the healing came from the snake. So they started worshipping the snake😟. King Hezekiah (715-686 BC) figured this out and had the snake smashed to pieces because he followed the Lord and wanted his people to do so as well. (2 Kings 18:4). Can you imagine how mad some people would have been at the king because he destroyed such an ancient relic? Well, here is something else I discovered in my research on the snake. Being that I am a nurse, I used to wear a necklace charm that depicted my career in medicine. I wondered how the medical profession got that symbol so I Goggled it. 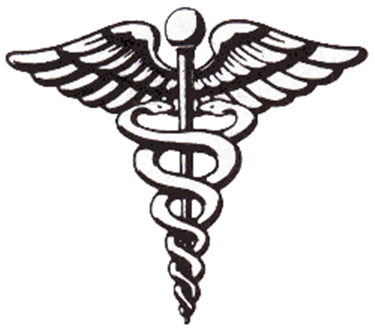 In Greek mythology, the Rod of Asclepius (a serpent-entwined rod) is associated with healing and medicine. (Not hard to figure where that idea came from!) I wondered when Greek mythology was first written. Although they say that it has been around since 2000 BC, nothing was written until the 700’s BC. Isn’t that interesting? Written mythology was written after Hezekiah destroyed the bronze snake. Can you see how mythology is just a re-invention of God’s supreme story? Satan is such a copycat! Yet, he twists his stories to turn you away from God. 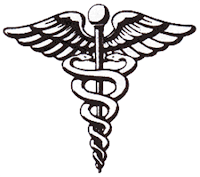 Back to the medical symbol. You are probably thinking…yeah, but that has two snakes and wings…. The American Medical Association did get their image right, yet they still explain it away from Christ. People just need to look to John 3:14 for the real meaning!!! I finished Luke today and all I can think is,......I want Jesus to do for me what he did for his disciples after he rose again. Open my mind, Lord! 🤓 Help me to understand it all!!!! I think this verse stuck out to me today because I commented on worry when reading about Martha in chapter 10. In context here, Jesus is saying, don't worry about how you will defend yourself. He will give the right words. What stood out to me was, "make up your mind not to worry". To me that sounds like we can decide whether we will worry about something or not. We aren't at the mercy of our emotions. When I teach the 5th and 6th grade girls at our school about how their bodies are changing, I talk about hormones and how they affect one's mood. Yet, I am always sure to say to these young ladies, that even though one can blame their bad mood on hormones, it is still in their control on how they will act. For example, they may want to yell at their little brother for his goofiness because they have little tolerance due to their bad mood, yet they can choose to walk away or do something other than yell at him. I love how Jesus said, "Make up your mind beforehand..."
We have the ability to think about a situation before we get into it and make up our mind beforehand how we will respond. We can make up our mind before a worrisome situation, and decide, "I will not worry, I will trust the Lord's got this!" I think that is such a powerful commentary on the human heart; how stubborn it can be! This rich man held logic that I believe most people have "If I see it, I will believe it." He was convinced that would be the case with his brothers (vs. 28). But, reality is, we have Satan whispering into my ears, lies (John 8:44), that lead us away from what we know is true. I have been traveling in my motorhome the past three weeks. I am fascinated with the typography of our country! I'm also intrigued by the fossils, footprints and bones of dinosaurs that are scattered throughout the central part of the United States. It's fascinating! Through the years I have learned that in order for fossils to have formed, there had to be a quick and deep covering of silt over the body, plant, or marine life so that other organisms and oxygen could not begin the decay process. Then pressure causes inorganic minerals to enter the organic cells. When the organic cell wall parishes, the inorganic minerals still hold that shape thus leaving, "petrified trees", for example (complete stone that looks like the tree it once was). They can't explain it because they don't want to see clear evidence that is right before their eyes. They may suggest a global catastrophe like a meteorite, but they can't attribute it to the global catastrophe of the Bible. That is why 16:31 stick out to me today. Man's heart can be so against God that they "will not be convinced even if" they are looking at the obvious. As I have mentioned before in a previous post, even if our logic thinks, "Seeing is believing", reality is actually "Believing is seeing." The first part of chapter 13 stood out to me today. Then he followed those statements with the parable of the man with the fig tree that didn't bare fruit. There was no explanation of that parable so we are left deducing what the meaning is by keeping it in context of what he said before that. So, the parables emphasis has to do with repenting before you're cut down (die). We may not be so quick these days to think that way, but calamities still shake us up and remind us of our mortality. 9/11 is a good example of that behavior. Church attendance rose dramatically after that event. That might be a good thing, but Jesus' warning here was not saying "Hopefully tragedy will wake you up" rather he is saying, "You may be the one IN the tragedy and then it will be too late for you." I like how Matt Skinner, a Bible commentator, wrote about 13:1-8. "Tragedy and hardship have their ways of nudging people toward God, but these verses suggest that tragedy and hardship come so suddenly that they often mark the end, not the beginning of our opportunities to live lives inclined toward God." Jesus gives us fair warning ⚠️. After all, he was repeating himself over and over! I hope all people that I know and love take note and get a 💯on this test! Today we read about Jesus being in the home of Martha. I must admit, I feel a little defensive every time I read this story! I think it's because I can identify with Martha during around in her dinner preparations. I'm sure this was a big group she was hosting (12 + Jesus and maybe more!) which requires a lot of prep!! So, yeah, I feel like I need to defend Martha a little bit. However, almost every time I read this story something new pops out to me. This time when reading, "you are worried and upset about many things" (10:41), I didn't read it in the context of the dinner preparations but rather in the context of a woman in general. We women get worried and upset about many things, don't we?! I could write a list of things I worry about and I'm sure things are popping into your head as you read this. "…but only one thing is needed." (10:42) That should be a poster on my wall! I need to be reminded of that every day, not just when I'm hosting a party! It's interesting that Jesus spoke of worry again two chapters later; this time addressing both men and women. Worry has been an on going issue throughout the ages. I love how Jesus says "do not be afraid, little flock," (12:32) that sounds so sweet and endearing, doesn't it? I pray that I could recall Jesus' sweet words right when I need them!! People were getting baptized by John to show that they were acknowledging God's way was right (vs. 29). The ones who were supposed to be experts on "God's ways" did not get baptized so they were showing that they did not believe God's ways were right. One commentary said a better translation of that verse would be that they, "Rejected for themselves the counsel of God". The whole purpose of the teachers of the law was to teach their fellow Israelites God's ways!! Yet, they "rejected God's will for themselves"
That just sounds so tragic, doesn't it? God's purpose for them, as well as for us, had been their salvation (1Tim 2:4). I'm sure you have pondered, "What is the purpose of life? Why am I here?" Reading the way Luke worded this passage it makes me think the answer to those questions boils down to.....your purpose, and mine, is to receive salvation. You can accept your purpose or reject it. I thank God that I have not rejected His purpose for me! Please, Lord, help some people I know, not to reject your purpose for them!! As I've mentioned before, the next time reading through the New Testament (starting end of Sept.), I'm going to do it chronologically. I'm looking forward to that because I think it will be easier to spot or understand differences in the four Gospels. Today, I spotted something that, in my opinion, was better explained in Luke than in Matthew. Remembering to reading context, "give" has nothing to do with money. Here "give" would be in reference to giving forgiveness, giving no condemnation or judgement (which it is line to what Matthew said in a shorter version in 7:2). When I think of "a good measure pressed down" I can't help but think about when I am baking and a recipe calls for brown sugar. It usually says "packed", so, you know to press the sugar down hard to get even more into the cup. So, with all this in mind, I just want to pray, 🙏🏻Lord, help me to use a huge measuring cup to pour out forgiveness to others because I already know that you have used the biggest, fullest, packed down, pouring over measuring cup for me!! I am being honest here, but I never really spent a lot of time pondering "Zechariah's Song". I just always thought that he was super excited to be a father and he got his voice back – so he praised the Lord. This time through, however, something caught my attention. Luke is very clear to explain that both Zech and Liz are descendants of Aaron, the priestly line (1:5). Luke also mentioned that Joseph, who Mary is pledged to, is a descendent of David. Zech isn't taking about his son! As a result of what he witnessed and believed, his "song" was ALL about Jesus in the first eight and last two verses. We know he's talking about Jesus because his own child would be from the house of Aaron , not David, as he said in 1:64. After first focusing on Christ and giving God glory, he then turned his attention to his own little baby, "And you, my child, will be called a prophet..." (1:76). Zech had his priorities straight as soon as he opened his mouth; Christ first and everything else (even one's own child) after that. THEN, Zech goes back to talking about Christ! What a remarkable man! He really had a love for the Lord. He observed all the Lord's commands out of love for him (1:6). God picked the right parents to raise John! God knew Zech & Liz would obey 1:5 and teach him the same love and devotion to their Lord! I want to be a parent like that!! Another catch up day! Only one chapter to read, if you are current on your reading!! I have to say, this is kind of a weird chapter. Mark has been fairly detailed up to this point and then sums up everything really fast. In fact, my commentary says that it is questionable if verses 9 to the end of chapter 16 were written by Mark. It may not be the original ending that Mark had penned, with the original being lost or he just ended his book at verse 8. That doesn't surprise me because even I, an amateur Bible reader, can see the change in style at the end. Pretty straight forward, don't ya think?! Mark 13:14 caught my eye in the reading today. Jesus is talking about the abomination that causes desolation. He says, "-let the reader understand-.." (13:14). Anyway, I thought the wording was so weird, I thought I would investigate more. It turns out, when Jesus is referring to the reader, he is referring to one that would be reading Old Testament prophesy. (Luke 21:22 makes that clear). That reader, when seeing these signs, would see that it was prophesy written in Daniel 9 (540 years earlier), now being fulfilled. Sure enough, this prophesy was fulfilled about 70 years after Jesus. Many commentaries agree that the "abomination that causes desolation" was the Roman army and "standing where it doesn't belong" would refer to the army being in the holy city of Jerusalem and the temple itself. What hit me with the wording in Mark, is that Jesus is expecting people to continue reading God's revelation to man; the Old Testament and the New. You don't just read the story once (like I do with every other book I read-I never read things twice!). But, it needs to be an on-going reading. As we continue in our reading, it may be that in our life time we will see end times signs unfold. We will be "the readers" who will get understanding to scripture that others before us could not. Have you ever wondered how much of your money you should give to God? First let's take a look at how much of our income we "give to Caesar". and 7.7% for Social Security and Medicare. But, let's not forget sales tax, fuel tax and property tax! It's estimated that this person would pay about 33% of their income to Caesar. Boy! The Israelites got off pretty good when God commanded them to give only 10% (a tithe) annually (Deut.14:22-26). So, are we to give 33% to Caesar and 10% to God? And a question many people ask is, would that 10% be off our gross or net income? Well, the fact is the N.T. doesn't give a percentage of what we should give to God. Instead it says, "Command them to do good, to be rich in good deeds and to be generous and willing to share." (1Tim 6:18). In fact, Jesus says in Luke 12:33, "Sell your possessions and give to the poor." He says this right after assuring his "little flock" not to worry about material possessions. This reminds me of what I have heard my husband say often, "You can never out give God." So, when I ponder how much I am to give to God, I'm not going to let that 10% mark hold me back from trying to out give God! If it is "more blessed to give than to receive" (Acts 20:35), I want to be more blessed! Again, in the words of my husband, "Do you want to be blessed off of gross or net?" "He spoke plainly about this (that the Son of Man must be killed and after three days rise again), and Peter took him aside and began to rebuke him (8:32). Here's a little bit of trivia for you, if you don't know already; John Mark, the author of the book we are reading, was a close associate of Peter (Acts 12:12). Therefore, it is speculated that this gospel consists of the preachings of Peter to the early Christians. In other words, the book of Mark is from Peter's perspective. So, Peter told this story over and over again to new believers. I don't know about you, but I would have been too embarrassed to share a story where I got "schooled" by Jesus. Yet, Peter shared this humiliating moment with everyone. I'm sure in hindsight, Peter could see how terribly important this moment was, so out of humility he shared it. He knew that this scene sets the tone for 8:34-38. Jesus knew the task he needed to accomplish and he expected his followers to demonstrate a similar commitment, attitude, and action. I love that Mark wrote the explanation Jesus gave on the parable of the sewer. But, he didn't write an explanation from Jesus on the parable of the lamp on a stand or the growing seed. So, I am left with questions! Given more of what? Truth? Faith? We can speculate, but a clear explanation from Jesus was not given. Luke has one difference in the telling of this parable. He says, "..even what he thinks he has will be taken from him"(Luke 8:18). If the "more" is truth, than isn't it sad to think that some will lose what little they think they have? One commentary helped me understand this parable a little bit. Barnes' Notes says "The meaning here seems to be, he that diligently attends to my words shall increase more and more in the knowledge of the truth; the one who neglects the word becomes more ignorant; the few things which he had learned, he will forget." It almost sounds like a "works" thing; you better keep learning or else! But then, the very next parable makes it sound like the growth in one's spiritual life happens all on it's own, "The seed sprouts and grows, though he doesn't know how (4:27). The Holy Spirit does the work. Lord, please let me be one of those that can perceive (4:12) and understand the things you teach through parables! Give me ears that hear! These were people so intent to "accuse Jesus" that they couldn't answer a simple question! They were exhibiting the hypocrisy Jesus was talking about in Matthew 23. It touched my heart to read that he was deeply distressed. He knows what's in store for them (Rev. 20:15) but that is not his will (or desire) for them (2 Peter 3:9). I just read a long paper on God's two wills. Piper says it like this, "God's will is sometimes spoken of as an expression of his moral standards for human behavior and sometimes as an expression of his sovereign control even over acts which are contrary to that standard." Jesus demonstrated the perfect way for us to respond to sin. We can be angry about the sin, but the feeling of distress he had, shows a compassion that we should also have when we deal with people who are in sin. Boy! There was a lot to learn from that one verse! I never noticed before, but Matthew started his book with "...and they will call him Immanuel-which means, "God is with us." (1:23). I love how Matthew brought to us the fact that Jesus fulfilled what Isaiah said 500 years earlier, at the start of his writing, then Matt concludes his writing of the life of Jesus by quoting Jesus one last time proving Isaiah's prophetic words were right. Mostly, I love the thought that Jesus is with me! That fact is something that all believers need to keep in mind through all the ups and the downs this life has to offer. One, is the popular song "It is Well With My Soul" written in 1876. The other is the popular poem written in my lifetime, "Footprints in the Sand". Can you think of other examples off the top of your head that remind Christians that Jesus is with us always? Judas is an interesting character in the story of Jesus. He is was chosen by Jesus as one of the twelve (John 6:70). He preached the Good News (10:7). He was in the number that stuck with Jesus when other disciples turned away (6:68). John also says Judas was a thief and stole from the group money bag, and didn't really care about the poor (John 12:4-6). Sadly, Judas didn't follow what Jesus said in 10:22.